The Customer shall bring the invoice, the transaction receipt, and the whole product to the store within 7 days of purchase for product replacement. If no bring the invoice, cannot be returned or exchanged. Product replacement form can only be used at the issuance date and will not be reissued if lost, please have the exact amount, and no change will be given. Please carefully check the product for defects prior to checkout. Products with damages or malfunctions caused by human errors or improper operation, cannot be returned or exchanged. Any product purchased by using pick-up or discount coupons shall not be returned for getting back the pick-up or discount coupons; however, it shall be exchanged for other products. Post-sale services of the electronic product: for a product that is not damaged due to improper use shall be returned or exchanged within 1 year of the purchase. Please bring the whole product with the proof of purchase sticker or invoice to the store for the return service. To those products purchased for over 1 year, the return service is not available and customers must repair such products on their own. 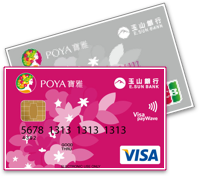 The customer shall enjoy the special discount as the purchase reaching specific amount paid by the POYA Joint Card on Wednesday. However, the discount shall not be provided if the customer returns or exchanges the product on the days except Wednesday. We apologize for any inconvenience this may have caused you.